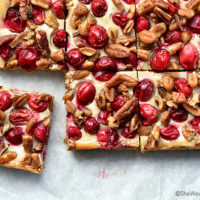 These Nutty Oatmeal Cranberry Bars are made with fresh cranberries, oatmeal and pecans for an easy sweet little bite or main dessert for any holiday occasion. I do love cranberry season, don’t you? There is something so uplifting about those perky tart red berries that just puts a smile on my face. Each year when they start popping up at our local grocers, I can hardly pass them up. They are so vibrant and colorful! I usually grab a bag or two to use in recipes and decorations. Over the years we have enjoyed cooking with them in both fresh and dried form in some of our favorite recipes, like Easy Homemade Cranberry Sauce, Spiced Cranberry Hot Toddy, Cranberry Pistachio Chocolate Muffins Recipe, or these scrumptious Nutty Oatmeal Cranberry Bars. Cranberries always bring a bit of life to the flavor party, not to mention color too! These Nutty Oatmeal Cranberry Bars are no exception. They are a sweet and tart bite balanced with nutty pecans and crunchy oatmeal, and they sure are a pretty addition to any holiday dessert menu. Of course, these bars are perfect for sharing at holiday potlucks. They’re so easy to pack and take along. Nutty Oatmeal Cranberry Bars are about as easy as it gets to making homemade treats. They are kind of like pie in that way, only easier. These are perfect as a small sweet treat to enjoy with coffee or hot tea, or serve larger portions, slightly warmed and topped with a scoop of vanilla ice cream for one delicious dessert. Oh my goodness, I’m wanting to make another batch right now just thinking about it! These east Nutty Oatmeal Cranberry Bars can be made ahead of time by a couple of days and kept covered and refrigerated. Or wrap tightly in plastic wrap, slip into a freezer zip-top bag and freeze for up to a month. Allow to come to room temperature before serving. Enjoy! 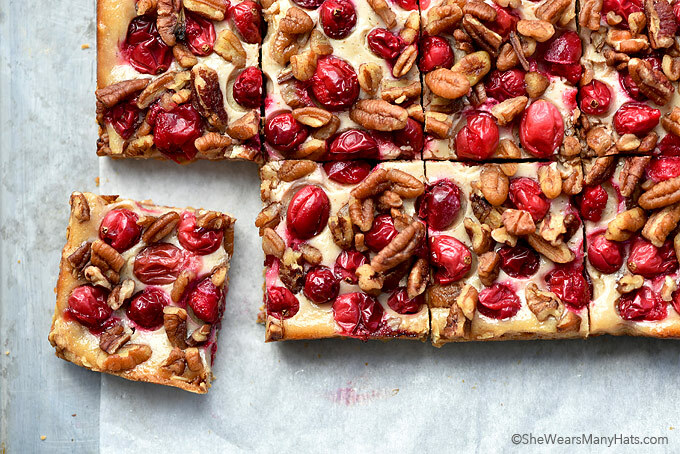 These sweet and tart bars are perfect for serving as a snack during coffee or tea time, or as a main dessert served a la mode. Preheat oven to 325-degrees F. Grease or coat with cooking spray a 9x13-inch baking pan. For Oatmeal Crust: Prepare crust by whisking together flour, oats, brown sugar, salt, baking soda, and cinnamon. Stir in melted butter and lemon juice until combined. Evenly press mixture into the bottom of prepared baking pan. For Cranberry Nut Topping: Combine sour cream, vanilla extract, lemon zest, flour and brown sugar. Spread mixture over crust. Spread fresh cranberries evenly over mixture, lightly pressing into mixture. Evenly spread top with chopped nuts. Bake at 325-degrees F for 45-50 minutes, until light brown. Let cool completely in pan before slicing. Hello Barbara! I haven’t tried these bars with frozen cranberries and would be concerned that frozen cranberries would have too much water in them. Maybe if you thaw them first and drain them a bit, frozen cranberries may work? Quick cook oatmeal may be used but the results will vary. I am in love with these bars! The perfect holiday treat! These look incredible! I can’t wait to make them! I love anything with cranberries! Just gorgeous and involves my favorite things ! I wonder how dried cranberries would work in this recipe. Has anyone tried? Are the cranberries cooked first, they are really hard right out of the bag? They are not cooked first. They cook in the oven and will not be hard. I usually cook/bake with UNsalted butter -trying to stay on a lower-sodium diet. How much salt should I adjust and add if I only have unsalted butter on hand? Or can I leave out the extra salt? You can leave out the extra salt. WOW ???? Beautiful, festive bars. Will add colour to any table ????. Thank you ????. 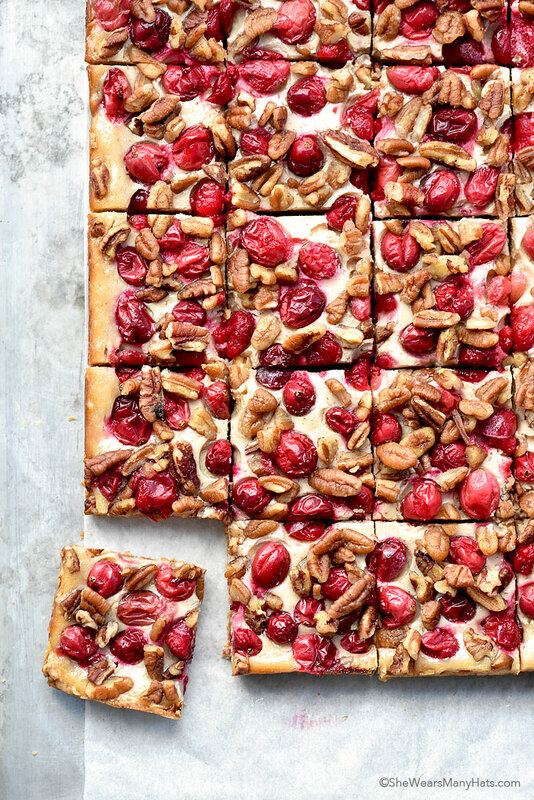 These nutty oatmeal cranberry bars are so Instagrammable and adorable! I’d love to make this for my family Christmas morning! Thx for sharing Amy! do you think these could be made with an all purpose gluten free flour instead? Yes, in theory, that should work. Can you sub cream cheese for the sour cream and yogurt? I’m not sure how that would turn out. If you try it let me know. 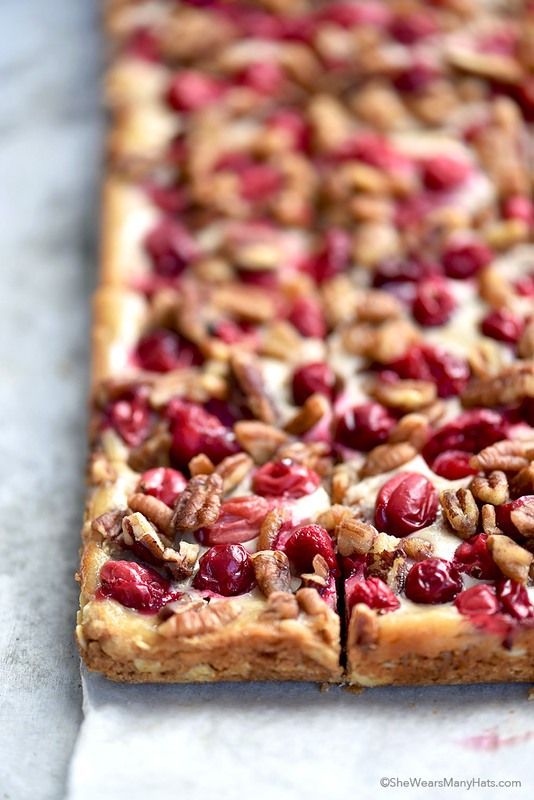 Oh my what an awesomeness nutty oatmeal cranberry bars! This was delicious – and so easy to make! Thanks so much! They are okay a day or two at room temperature, if longer than that, I would recommend refrigerating them. These are perfect for the holidays – different from all the classic cookies, and they disappear quickly! Such a great dessert for holiday gatherings! I am adding these to my baking list. These bars are just pure holiday heaven!! There so pretty, they make the perfect edible holiday gift. These look amazing! Thank you so much for this recipe; will make it soon for sure. I’m so obsessed with these! I love using fresh cranberries in desserts! Made these yesterday for the holiday party and people praised the flavor (nice and tart with nutty, brown sugary flavors). I put in a little more cinnamon, added a pinch of nutmeg and cardamon and used walnuts since I had those and didn’t want to head to the store to buy pecans. Made it with a Meyer lemon and may try orange next time. Oh, and regular unsweetened yogurt works fine – make sure to pour off the whey (watery liquid) and use the thicker yogurt if you have a tub in the fridge. I can’t WAIT to try this recipe! I can just image eating one (or three!) with a hot cup of tea! These are gorgeous – the bright, beautiful colors. I can’t wait to try them!